Cannibal Corpse is a American death metal band from Buffalo, New York, formed in 1988. The band is known for their graphic album covers, explicitly violent lyrics and song titles like "I C** Blood" The group got into mainstream after performing the song "Hammer Smashed Face" in the 1994 film Ace Ventura: Pet Detective. In 1995, vocalist Chris Barnes left the band to focus on his new death metal project Six Feet Under. He was replaced by George "Corpsegrinder" Fisher of the band Monstrosity, who has remained as the frontman since. The band is also known for being banned in Germany, Australia, Russia, etc. The group discontinued the graphic album covers in 2006 and continue to perform and release new material. 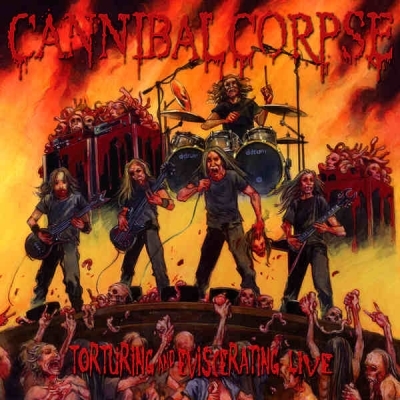 One of the earliest death metal bands, Cannibal Corpse is often cited as a major influence for the subgenre and is the world's best selling death metal band, with about two million copies sold worldwide as of 2015.